“Mayor de Blasio, fortunately for the great majority of New Yorkers, is not Mike Bloomberg, whose contempt for working people was legendary. The people of Chinatown and the Lower East Side represent one of the last working class and low-income communities of color in New York City. Our neighborhood was planned and built as a bastion of affordability and we have been fighting to protect and grow our community in the face of massive displacement pressures. We are appealing to you because we know you are an advocate for the poor, an advocate for justice. We are facing a crisis in our neighborhood. In this community, families––families with children, families taking care of the elderly––are being pushed out of their homes. Since our Mayor, Bill De Blasio, took office, homelessness has reached an all time high and the disparity between rich and poor is growing every day. Rents are skyrocketing, along with property taxes, and our schools, senior centers, community programs and other services are being drained of funding and closing down. Small businesses are closing down. Public land is being used to build luxury highrises. Public housing is being sold and falling into disrepair. Why is this happening? Because our community has no protections in place against luxury development. Because our city government is refusing to hear the demand of the people of this community to pass a rezoning plan to protect our neighborhood from luxury development and its attendant displacement. Because our government gives property-tax breaks to luxury developers to build in our backyard via the 421-a tax giveaway. Chinatown and the Lower East Side have united to fight for the city to pass a rezoning plan, the Chinatown Working Group Rezoning Plan, that will protect our community from displacement. The city is refusing to pass the plan, saying it is “too ambitious”. A similar plan was passed in 2008 to protect the mainly white and wealthy East Village. Why is our plan too ambitious when theirs was not? This is racist. Your Holiness, we need your help. Support the people of Chinatown and the Lower East Side who are coming together to save our community. Please tell our Mayor to stop financing luxury developers to push us out of the community we’ve built. Tell him to heed the people and pass the Chinatown Working Group Rezoning Plan. We hope you will join us in this fight and we invite you to join us on Friday, September 25th, as we march from the Lower East Side to City hall. Community Members Spreading the Word: We Will March! 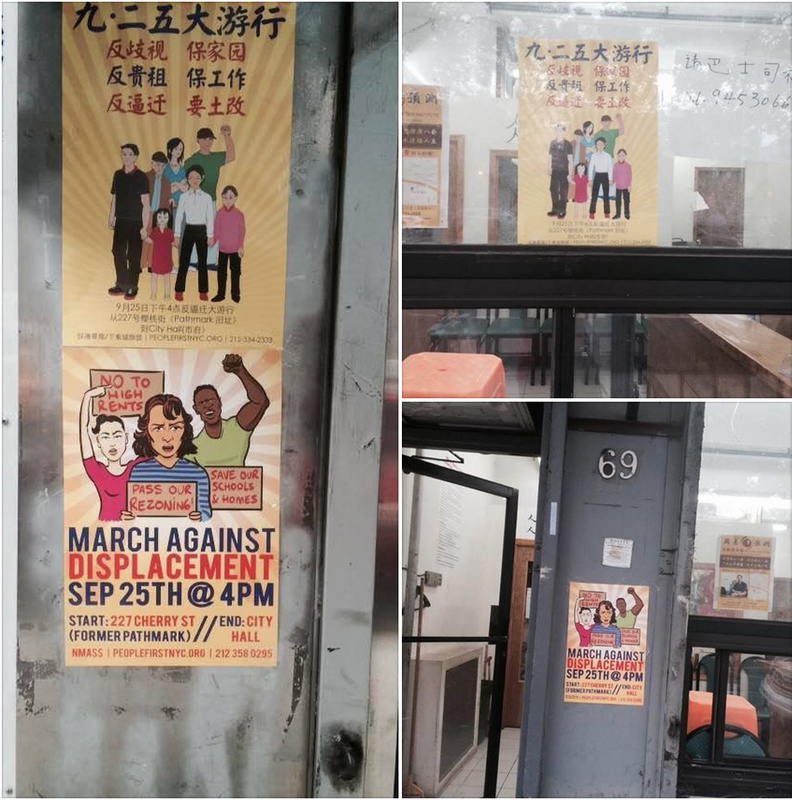 All around Chinatown and Loisaida, posters are going up in the windows of homes and businesses: we will march!